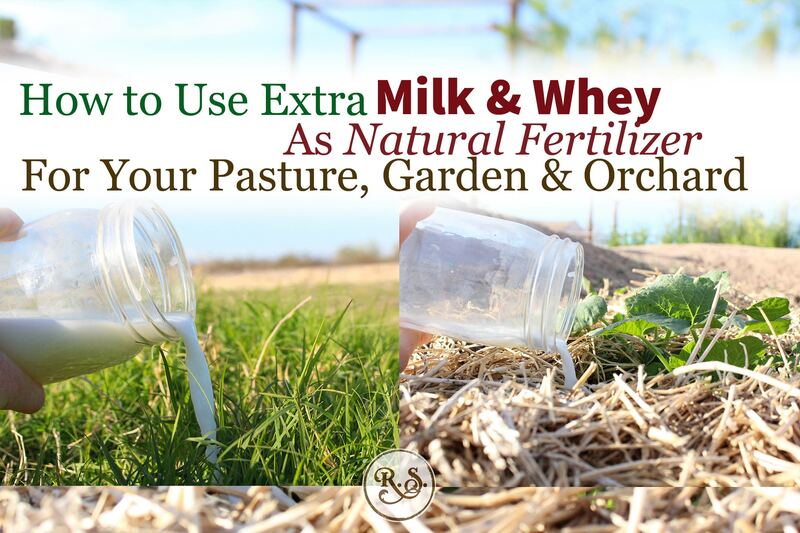 Milk is an amazing organic fertilizer to build natural fertility! In your orchard, pasture and garden it is a completely natural, holistic and Organic option. When your goats or cow is giving you an overabundant supply of milk this is one great way to put it to use without wasting it. The problem of finding natural, holistic, organic fertilizer is easily solved on the homestead by extra milk or whey from making cheese. Diluted it can be applied to even your indoor plants. When I first came across this I was so glad to have yet another resourceful way of using our excess milk and whey. There are peak seasons where you are up to your eyeballs in milk and simply don’t have time to make cheese or soap every other day. Over the years I’ve heard of the benefits of using milk in the garden or soaking watermelon seeds in milk. I’ve never watered a pumpkin with milk like Almanzo, but I have taken the Garden Guy’s advice and soaked my watermelon seeds in milk. And yes, the water melons always turned out amazing! Here are the quotes from the few resources I’ve found over the years. Compared to all the gardening and homesteading books out there, this isn’t much on the subject. It is enough though to make you realize that it might be a good thing to pay more attention to. “[Raw milk or whey]..is useful on both large areas or the smallest flowerpot with results that are consistently impressive...David Wetzel..dressed sections of land with various ratios of raw skim milk or whey and water using a tractor-mounted spray rig. Results have been so gratifying that Wetzel urges those needing fertilizer to order up a tanker of milk from the nearest dairy. He suggests paying the farmer a premium over the meager price he would get from the co-op. ‘It’s worth more on the land,’ he declares. For the small-scale homestead, that would be about 1 cup of milk or whey to every 6 cups of water—more or less. It’s not an exact number. You can mix up your diluted milk in a five gallon bucket and dump it on your pasture. If you want to get fancy you could buy a sprayer (that hasn’t had chemicals in it before) and use that. It might make things a little bit easier. This is simple and yet the rewards she goes on to describe in her book show that it’s more than worth it. Plants too well with a diluted amount of milk! I have to say, my own experience confirms the benefits of this great tip! Both of these quotes are quite interesting! If you are wondering how to apply it, I’d go with the recommendations for fertilizing pasture (about 1 cup of milk or whey to every 6 cups of water). Sorry, no quotes here. I wish I had, but as of yet I have not come across any directly related to the orchard or trees. After reading the quotes above, I think it’s safe to say it would be great for your fruit trees too. I’ve used it on my fruit trees and have had no problems, although I can’t really tell yet (by looking at the trees) that it is actually benefiting them. Understanding how great it is for the pasture and garden and understanding a little bit about the microbes in the soil though, I assume the results would be similar.